The Judge speaking in Cormac McCarthy's Blood Meridian, 206. My FILMIC project addresses an issue surrounding the nature of film, that of its malleability in terms of the manner in which it mimics reality so effectively that it is mistaken for reality. In Bigfootage I am trying to underscore this attribute by focussing on images derived from "actual footage" of sightings of an enormous and elusive (mythical) creature variously named Bigfoot, Sasquatch, Yeti, depending on location, language or culture. As the owner of an actual Sasquatch doll I feel qualified to add my filmstrip to the collection. The original Sisters of St. Joseph (17C) were known for their handmade ribbon and lace. A representation of this is depicted on a banner made from silt cloth, a recycled construction material. 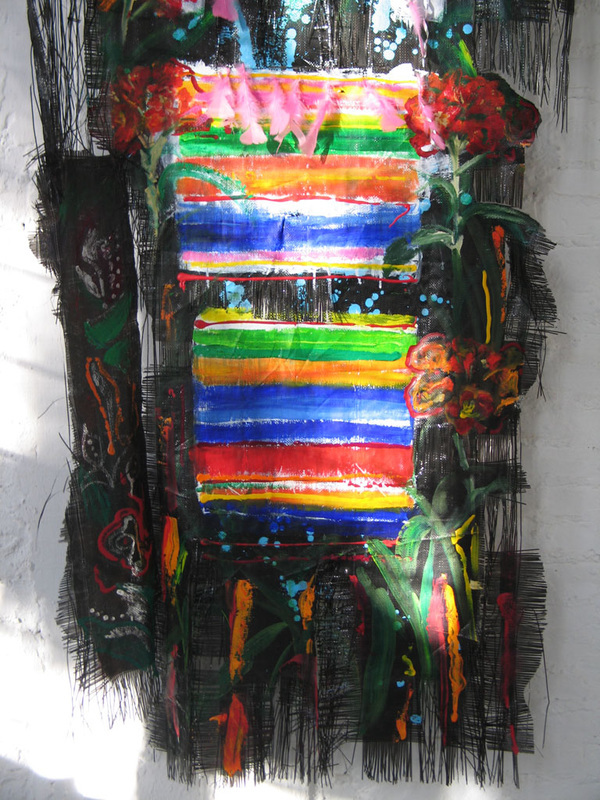 The fabric becomes the ground for painted images suggestive of both the luxury of a silk stole and the basest of materials, usually found on roadsides by construction sites. Its use emphasizes the enormous gap between the creation of luxury goods for wealthy patrons and the poor to which the order is dedicated. Another connective level exists in the idea that nuns are considered brides of Christ. The majority of the lace used in the banner came from Beckers Bridal where wedding gowns are designed and made for today's brides. SILT/SILK consists of hanging panels of fringed silt cloth salvaged from demolition sites in the once vital inner city core of Oshawa Ontario Canada. Situated on the eastern edge of Toronto, the city has historical potency as a major industrial site, a labour town, and a stable working class community that is now under threat through global economics. The artwork connects materially to the demolition of a former General Motors paint plant. During the decades of its existence, the plant imbued a wide radius (my neighbourhood) with the smell of paint and infected the land where it was situated. The lengthy, dramatic, and meticulous process of taking it all down has been surrounded by chain link fencing cloaked in silt cloth. Used in demolition sites, silt cloth is attached to fencing to prevent street access both visually and physically and as an attempt to keep the dusty process enclosed. Often it lies discarded by the roadside where it becomes interwoven with ambient vegetation. Suspended from acrylic rods by fishing line filament, the fabric becomes the ground for painted images suggestive of both the luxury of a silk stole and the basest of materials. Given the gallery location in Mexico, the imagery connected to both my locale, and the suggestion or idea of Mexico that resides within the consciousness of my community in Oshawa. Therefore the hanging panels embody a sense of both locations, authentic and also inauthentic, from the viewpoint of people in my milieu. An interview and documentation process was carried out in Oshawa over the preceding year and included as a sound piece in the installation. The use of industrial materials such as silt cloth underscores the expression of movement between idea and exploration, and the way in which concept and process are inextricably linked. from a series of artworks based upon the images and memories surrounding current and historical attempts to revive Oshawa's once vital and hopefully renewable inner core. The artwork consists of image-transfer and acrylic painting on canvas, accompanying journal, and the use of industrial materials such as silt cloth and fencing. In all of the work I am interested in expressing the movement between concept and formal exploration, and the way in which they intertwine. The use of silt cloth connects to the subject because some of it was taken from the demolition site where an ACSYS plant was being dismantled. The use of garden imagery contrasts with the fringed silt cloth used to maintain street access through this dusty process. It attaches to chain link fencing which prevents public access to the site. The project of returning land to its pre-industrial state is lengthy and expensive. Formerly a GM paint plant and a Peregrin factory, the plant imbued a wide radius with the smell of paint over decades of use. The dramatic, meticulous process of taking it all down has provided imagery for these artworks.